I am often asked how to choose the right container for a container garden. 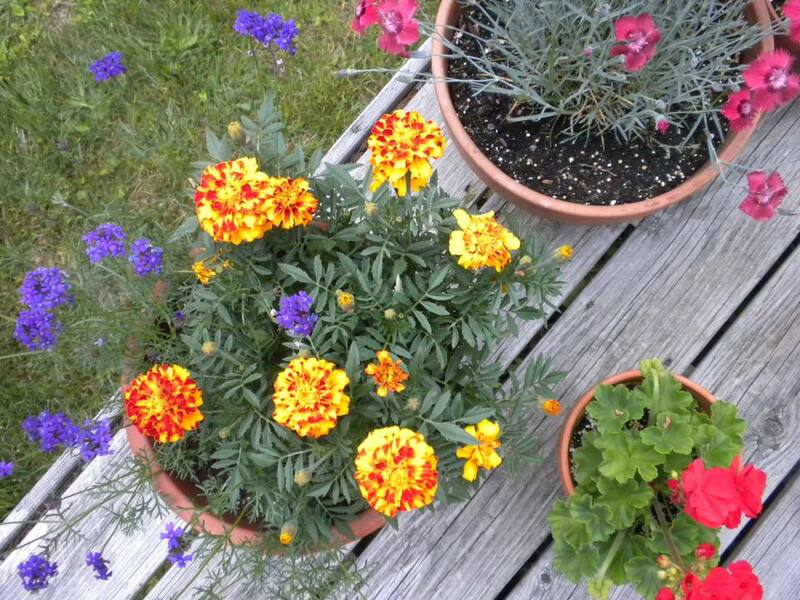 The simple answer is that there is no one "right," container for a garden, there are many "right" containers. That said, there are a few guidelines that can help you make the decision. The choice of container style is truly unlimited. You can use anything at all -- from a clamshell to a recyclable grocery bag, to a classic terracotta pot. It really depends on your budget, your aesthetics and what you want to plant. Anything can be a container, from a trashcan to a laundry basket. That said, not everything should be a container, especially when growing edibles. There is evidence that tires and some rubber may not be a healthy planting alternative. Also, beware that some plastics can leach chemicals into the soil so if you are growing edibles use a food grade plastic. Terra cotta pots are classic and beautiful, but because they are porous, can dry out very quickly, especially in the wind and sun. I love the look of terra cotta and to combat soil dehydration, I often will line them with plastic, or use them as a cachepot, placing a lightweight pot inside the terra cotta. Metal pots are great--some of my favorites are metal but can get really hot, burning your plant's roots and drying out the soil in what seems like a nanosecond. Again, to combat this, I line them with moss, bubble wrap or use them as a cachepot. I also will try to put them in shadier spots so they don't bake my plants. Glazed ceramic pots can be some of the most gorgeous pots. They can be incredibly modern or classic in design and the colors can be stunning. I love glazed pots, the downside is that they can be heavy--big pots can weigh a ton, especially if they are filled with soil and plants. I use a handcart to move them inside during the winter, but it can be a real struggle. Fabric containers are some of my favorites. I use everything from recycled grocery bags to Smart Pots. Plants seem to love growing in fabric and they have the added advantage of being lightweight, usually inexpensive and super easy to store. In general, the bigger your container, the more likely it is that your plants will survive. You have to water large pots less frequently because the more soil there is the more moisture it can retain. Also, a larger pot will give you a greater margin for error in fertilizing and watering. That said, aesthetically you don't want to have your plants get lost in too big a pot. If you travel a lot or simply don't want to worry about plants drying out, you can buy a self-watering container. Some self-watering containers are particularly great for growing vegetables because they give plants a steady moisture level, which most plants love. Self-watering containers come in many styles, from utilitarian to glamorous. And every year there are more to choose from. Sometimes I buy plants that I can't resist and then choose the container, and sometimes I choose the pot and then buy plants to fill it. If you see a container you love and can afford, get it. You can always find a plant or combination of plants that will look fabulous in it. Grow Your Own Garlic in a Coffee Can!